Crap, now I mixed myself up... none of the charts seem to show the Opteron going from a loss to a win. Indeed, the Opteron is slower than XEON across the board in the Blowfish section. Kudos on a good follow-up article, though I felt the original had far more merit than most others did. It must've been difficult to decipher the valid and constructive criticism from all the blather. You say "Had we left the default -O2 compilation, Blowfish hashing would have been faster on the Xeon processor than the Opteron. However, as soon as we use -O3, the Opteron outperforms the Xeon processor." However, the only graph that shows the Opteron going from a loss with -O2 to a win with -O3 is the bottom MD5 graph. Perhaps you meant to say MD5 then in your comments, or are some of the graph numbers wrong? 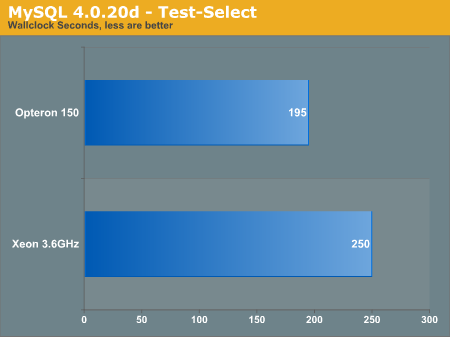 "Without a doubt, the Opteron 150 trounces over the 3.6GHz Xeon in real world benchmarks." 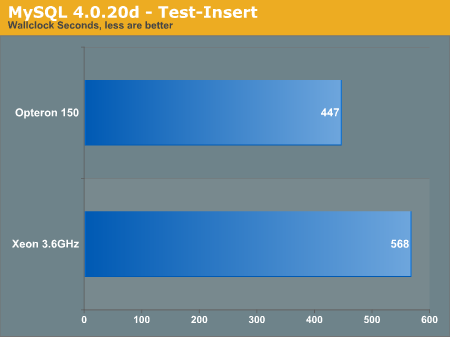 BTW, AMD's Opteron 150/250 is directly comparable with Intel's Xeon 3.6GHz in 1-way & 2-way systems. So before a nice old J. Beam integrates the hours of my day into peaceful, cushioned oblivion, let me assure you that from my point of view you did a very good job today. You endured a continuous datasphere bashing and gave your best to adress criticism in a constructive way. "When the 3.6F actually shows up at newegg with a price, then i will tell you for sure what it competes against :)"
Nice article and better benchmarks. Now that is what I call great damage control :-) Way to turn it around KK, now go enjoy your vacation! Ah I hadnt noticed you put it there but you have to realy know what you are looking for to be able to see that it is not the standard GCC 3.3.3 compiler. Maybe put a small note at the bottom of the compiler section in bold saying "This is not the standard GCC compiler" or the like as most people will not notice that it isnt standard. but I have to say its nice to see Linux getting such a large main steam coverage.